QGIS has support for approximately 2,700 known CRSs. 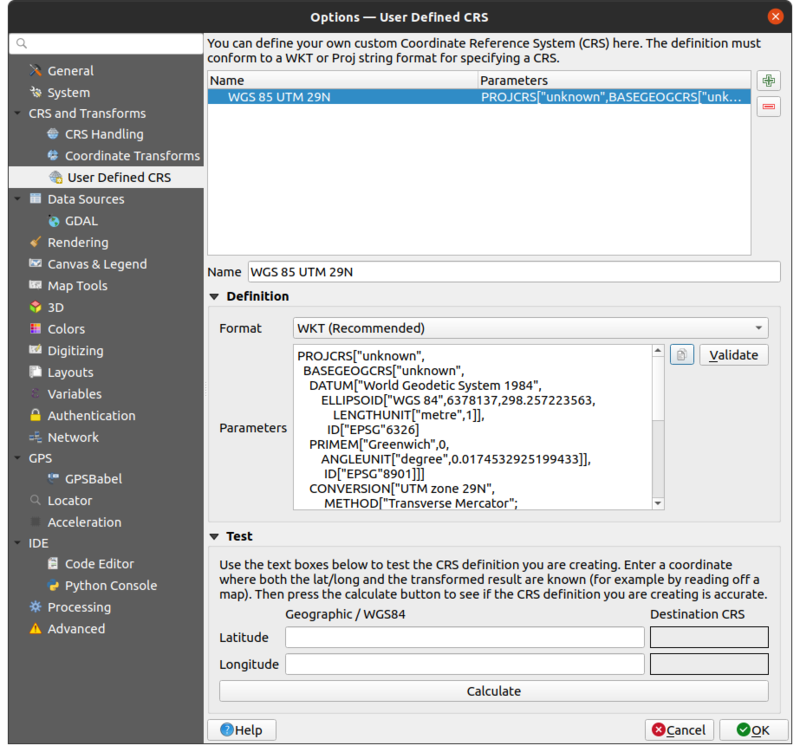 Definitions for each CRS are stored in a SQLite database that is installed with QGIS. Normally, you do not need to manipulate the database directly. In fact, doing so may cause projection support to fail. Custom CRSs are stored in a user database. See section Custom Coordinate Reference System for information on managing your custom coordinate reference systems. The CRSs available in QGIS are based on those defined by the European Petroleum Search Group (EPSG) and the Institut Geographique National de France (IGNF) and are largely abstracted from the spatial reference tables used in GDAL. 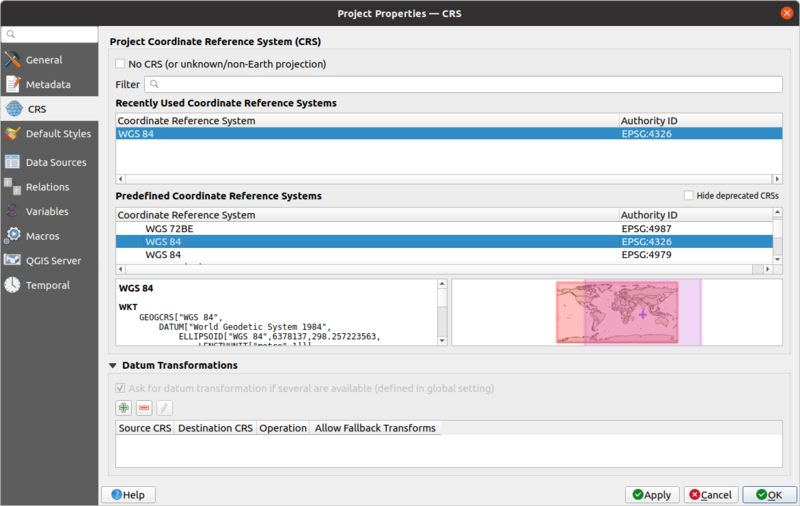 EPSG identifiers are present in the database and can be used to specify a CRS in QGIS. In order to use OTF projection, either your data must contain information about its coordinate reference system or you will need to define a global, layer or project-wide CRS. For PostGIS layers, QGIS uses the spatial reference identifier that was specified when the layer was created. For data supported by OGR, QGIS relies on the presence of a recognized means of specifying the CRS. In the case of Shapefile, this means a file containing the well-known text (WKT) specification of the CRS. This projection file has the same base name as the .shp file and a .prj extension. For example, a shapefile named alaska.shp would have a corresponding projection file named alaska.prj. Whenever you select a new CRS, the layer units will automatically be changed in the General tab of the Project properties dialog (Project ‣ Properties…). If you want to define the coordinate reference system for a certain layer without CRS information, you can also do that in the Source tab of the raster and vector properties dialog (see Source Properties for rasters and Source Properties for vectors). If your layer already has a CRS defined, it will be displayed as shown in Source tab in vector Layer Properties dialog. Right-clicking on a layer in the Layers Panel (section Layers Panel) provides two CRS shortcuts. Set layer CRS takes you directly to the Coordinate Reference System Selector dialog (see figure_projection_project). Set project CRS from Layer redefines the project CRS using the layer’s CRS. Sometimes, you receive a layer and you don’t know its projection. Assuming that you have another layer with a valid crs that should overlaps with it, enable the OTF reprojection and, in the Source tab of the Layer properties dialog, use the Coordinate Reference System selector to assign a projection. Your layer position is then moved accordingly. You may have to do some trial and error in order to find the right position, hence its original CRS. If QGIS does not provide the coordinate reference system you need, you can define a custom CRS. To define a CRS, select Custom CRS… from the Settings menu. Custom CRSs are stored in your QGIS user database. In addition to your custom CRSs, this database also contains your spatial bookmarks and other custom data. Defining a custom CRS in QGIS requires a good understanding of the PROJ.4 projection library. To begin, refer to “Cartographic Projection Procedures for the UNIX Environment - A User’s Manual” by Gerald I. Evenden, U.S. Geological Survey Open-File Report 90-284, 1990 (available at ftp://ftp.remotesensing.org/proj/OF90-284.pdf). Note that the Parameters must begin with a +proj= block, to represent the new coordinate reference system. You can test your CRS parameters to see if they give sane results. To do this, enter known WGS 84 latitude and longitude values in North and East fields, respectively. Click on Calculate, and compare the results with the known values in your coordinate reference system. In QGIS, ‘on-the-fly’ CRS transformation is enabled by default, meaning that whenever you use layers with different coordinates system, QGIS transparently reprojects them while rendering to the project CRS. For some CRS, there are a number of transforms available. QGIS allows you to define the transformation to use otherwise QGIS uses a default one. or predefining a list of the appropriate default transformations to use when loading layers to projects or reprojecting a layer. Indicate the Source CRS of the layer, using the drop-down menu or the Select CRS widget. Likewise, provide the Destination CRS. Depending on the transform grid files (based on GDAL and PROJ version installed on your system), a list of available transformations from source to destination is built in the table. Clicking a row shows details on the settings applied (epsg code, accuracy of the transform, number of stations involved…). You can choose to only display current valid transformations by checking the Hide deprecated option. Find your preferred transformation, select it and click OK.
A new row is added to the table under CRS ‣ Default datum transformations with information about ‘Source CRS’ and ‘Destination CRS’ as well as ‘Source datum transform’ and ‘Destination datum transform’. 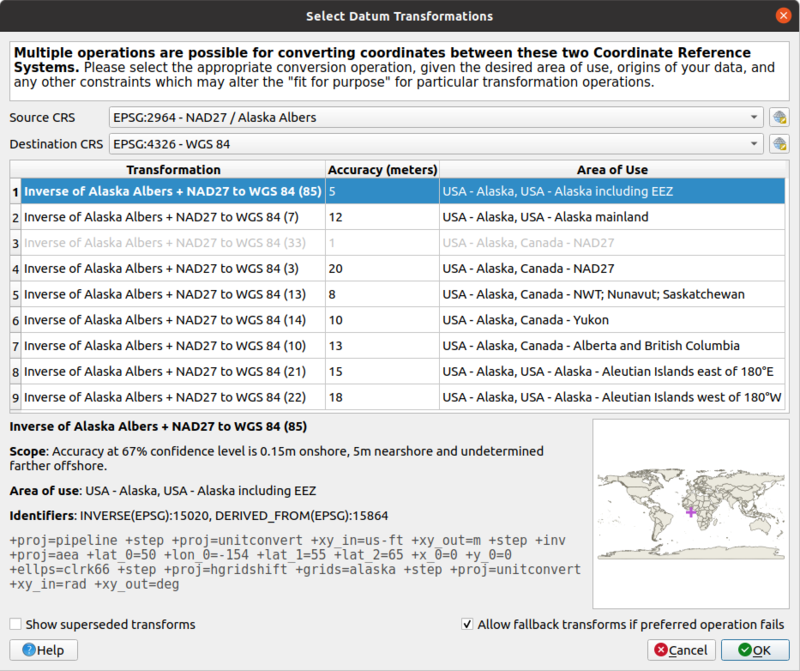 From now, QGIS automatically uses the selected datum transformation for further transformation between these two CRSs until you remove it from the list or replace it with another one.